Dr Rosemary Williamson discusses what we expect of our prime ministers in times of natural disaster. How do our prime ministers present themselves as leaders of Australians when disaster strikes ? Cynics might say that natural disaster has become a media opportunity for those keen to show themselves in a favourable light. Others might say that natural disaster presents a singular challenge and accentuates qualities of leadership less obvious in other contexts. Whatever your view, parliamentary and newspaper records of some of Australia’s worst natural disasters show a long tradition of prime ministers acknowledging the effect of natural disaster on Australians. Over time, these records also show prime ministers themselves, as leaders, affected by natural disaster. 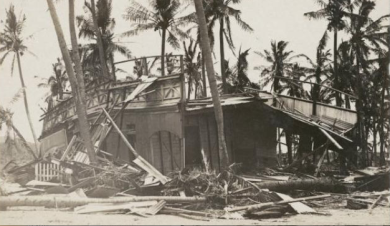 The cyclone that hit Mackay on 20 January 1918 caused 30 deaths. Damage to telegraph poles meant that it was not until 29 January that the Brisbane Courier printed a telegram from Prime Minister Billy Hughes expressing ‘deepest sympathy to the sufferers and bereaved’. Hughes promised federal government support ‘within its power’ and said federal government representatives would visit ‘immediately’. Over subsequent days, newspapers printed more telegrams about the recovery effort, including from Hughes. However, Hughes did not refer to the cyclone in parliament. Bushfires in Victoria from February 1926 caused 60 deaths, with the worst occurring on 14 February, ‘Black Sunday’. In parliament on 17 February, Prime Minister Stanley Bruce read a message of sympathy from the king and, assuming members would want him to ‘add a word on the subject’, he went on to express sympathy and outline government aid. ‘The one bright feature of these tragic happenings’, Bruce said, was ‘the wonderful heroism and self-sacrifice of those concerned, whose conduct has been in accord with the best traditions of our nation’. Victoria’s The Age printed his speech as ‘An Offer of Help’, on 18 February. Connecting with Australians through the press and praising the Australian character in parliament are now expected after natural disaster. Yet the responses by Hughes and Bruce seem distant and minimal when compared to those of later prime ministers. Harold Holt was prime minister when parliament met on 21 February 1967, two weeks after Tasmania’s ‘Black Tuesday’ bushfires, which killed 62. In responding to questions about the disaster, Holt mentioned that he was in New Zealand during the fires but immediately tried phoning the Premier of Tasmania. He reassured members that ‘our performance has been above what might reasonably have been expected of us’. Holt did visit the disaster area, which was acknowledged in parliament and reported by newspapers the day after, on 10 February. Newspapers showed Holt as empathetic. They reported his likening of the disaster zone to a ‘blitz’, and some included photographs of him surveying damage or talking to a survivor. The Sydney Morning Herald narrated his tour vividly, describing a ‘shocked and saddened’, ‘a sombre, unsmiling’ Holt, who appreciated the closeness of Australians at times of adversity. He had ‘come to symbolise the concern and affection felt by all Australians for Tasmania’, a sentiment echoed in Tasmania’s The Mercury. He also understood the importance of being on the scene: ‘I had to come to see for myself and to assure you of prompt and ready help’ (Sydney Morning Herald); ‘only the direct evidence of one’s visual impressions gives a realistic picture of what occurred’ (The Age). Holt’s direct experience of the aftermath of the fires, and the extent of its coverage by the press, may seem unremarkable now. Yet Australians had not always seen prime ministers in this way. Advances in media and communication technologies had enhanced the vicarious experience of natural disaster, and Holt was clearly sensitive to the importance of being there, and even being seen to be there. Seven years later, another calamity would show what happened when a prime minister was perceived, at least by some, as getting it wrong. Cyclone Tracy destroyed Darwin early Christmas morning 1974, causing 71 deaths. Newspapers conveyed a message from Prime Minister Gough Whitlam, who was overseas on an extended tour. Whitlam was ‘horrified’ and conveyed his ‘own profound sense of shock at this grievous calamity and [his] heartfelt personal sympathy for all the victims’ (The Australian). 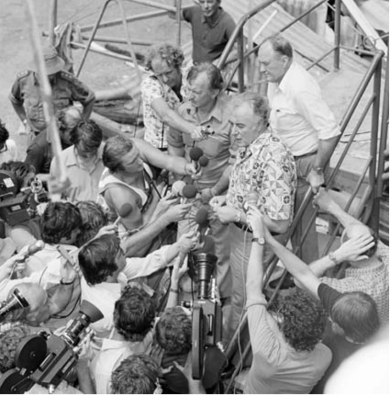 Acting Prime Minister Dr Jim Cairns initially visited Darwin and received widespread praise for his actions. Whitlam did fly back to see Darwin but then returned back overseas. Both trips made the news. 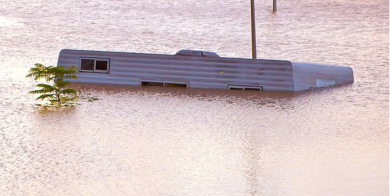 He had not been the first prime minister to be absent when disaster struck – Menzies was overseas for several weeks in 1955 during severe flooding in the New South Wales’ Hunter Valley and did not break his trip – but Cyclone Tracy was unprecedented. On 28 December, in the lead-up to Whitlam’s return, one commentator predicted 'his appearance among the debris of Darwin should have the same uplifting effect as King George VI’s ventures into the rubble of war-blitzed London’ (The Australian). Another praised his ‘frantic flight’ and said, ‘one of the duties of a Prime Minister is to make symbolic demonstrations of the public will’ (The Age). Whitlam was well and truly in the public eye. Later on, some claimed he spent more time visiting the ruins of ancient Greece than those of Darwin, a criticism taken up by cartoonists. Whitlam’s response to Tracy was given a political edge in parliament too. On 11 February 1975, he made a lengthy ministerial statement on the significance of his ‘mission abroad’. The brevity of his return to Darwin was mentioned in the ensuing criticism. Speculation about the consequences of a prime minister’s public response to natural disaster was rife in the case of Malcolm Fraser, who faced one of Australia’s worst bushfires during the 1983 election campaign. Seventy-five people died in the Ash Wednesday (16 February) bushfires in South Australia and Victoria in 1983. Prime Minister Malcolm Fraser and Opposition Leader Bob Hawke suspended their election campaigns, and Fraser visited both states. Like Holt, Fraser used a war metaphor to express what he saw – he compared the landscape to the damage wrought by a Panzer division – which was reported in the press. Paying attention to people rather than politics was a recurring theme in newspapers on 18 and 19 February. Photographs showed a sombre Fraser viewing burnt-out areas and interacting with emergency workers and victims. An Age article ended with a survivor thanking him: ‘People appreciate you coming in their time of adversity’. Fraser, according to The Sydney Morning Herald, had ‘resumed his role as leader of the country, rather than that of a political party’. A similar comment was made in The Age, which said Fraser believed his visit would demonstrate government concern and ensure State-Federal arrangements were in place. Some journalists wrote about his own experience of bushfire, which ‘you find in most country men’ (The Age). When a journalist asked about the funding of fire relief, Fraser reportedly snapped that it was inappropriate ‘to quibble’ about this when people were dying (The Australian). There was plenty of conjecture about what Fraser’s actions meant for the looming election. The Australian said that even if he denied a political motive, Fraser was politically obliged to visit South Australia and Victoria. That he was seen to be ‘leading the nation, at the centre of crisis, caring but coolly in control, a reassuring figure of strength and comfort’ (Sydney Morning Herald) was seen as helping his prospects. Comparisons with Hawke were made: ‘There is nothing like a national crisis to distinguish the substance of the Prime Ministership from the shadow of Opposition Leader’. Tragedy apparently revealed another side to the prime minister: ‘the bushfires melted his stony façade; human tragedy gave him a human face, at least for five days’ (Sydney Morning Herald). Fraser lost the election. It is impossible to say whether, and to what extent, his response to Ash Wednesday mattered at the polls, but at the time, it was seen as relevant. He was out of office before he had a chance to comment on the fires in parliament. Prime Minister John Howard interrupted a holiday to visit Canberra following the 18 January 2003 firestorm, a disaster unprecedented in its suddenness and ferocity. Predictably, The Canberra Times reported him meeting with victims who reminded him ‘of that great Australian spirit’. Perhaps less predictably, his prompt and empathetic response was interpreted in that paper on 25 January as a turning point in his ‘strained’ relation to Canberra. Howard said somebody in his position should show ‘concern and empathy’ wherever such disaster happens but also mentioned ‘the particular affinity between a Prime Minister and the city of Canberra as the national capital’. Howard formally commemorated Canberrans' losses and 'the strength of the Australian spirit' in parliament on 4 February 2003. Howard faced his fair share of natural disasters during his term. He was in hospital during the landslide at Thredbo, New South Wales on 30 July 1997, so initially was limited to a message of support through the press. Later, on 25 August, he delivered a condolence motion in parliament, which praised ‘the Australian tradition and the Australian spirit of working together unselfishly in difficult circumstances to help one’s fellow Australians’. 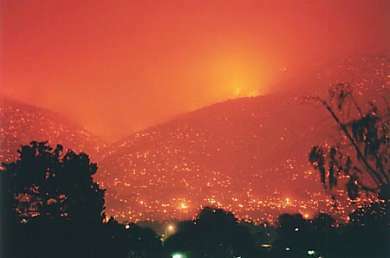 In 2006, Howard’s visit to and comments on fires in Tasmania were reported in the press in the context of climate change. Julia Gillard was prime minister in 2010-11 when several regions of Australia suffered from flood or cyclone in the so-called ‘summer of sorrow’. The media showed Gillard surveying damage and comforting victims, and later reported her delivering a condolence motion to parliament. Her speech commemorated those who had died and the ‘heroes’ who had helped, and articulated ‘what it means to be Australian’ when facing adversity. Gillard’s emotional delivery of this speech was front page news. Headlines from 9 February 2011 included, ‘Do the PM’s tears show the real Julia Gillard? (The Australian), ‘Rising tide of emotion in the face of a wounded nation’ and ‘Prime minister bares the pain for a nation awash with grief’ (The Age, The Sydney Morning Herald). Her eighteen-minute condolence motion was uploaded to Youtube and embedded in online press reports that speculated on whether her tears would change public perceptions of her as a leader. This overview is selective, but it is revealing. While prime ministers have consistently expressed sympathy and support following disaster, there has been a growing emphasis in parliament and press on the prime minister ‘being there’ for Australians – physically and emotionally – when disaster strikes. Natural disaster, as we’ve seen, becomes part of political stories because it can throw a spanner in the works. Disaster can quickly shift attention to the qualities of the prime minister at a time when Australians are most vulnerable. It can have us all – people and prime ministers alike – thinking and talking about the nature of leadership under extraordinary circumstances, and whether our leaders measure up. All of this begs the question of what tales have yet to be told. Experts tell us to expect more, and more intense, sudden natural disasters. Australians will have expectations of prime ministerial leadership at these times. Apart from promises of federal aid and co-operation with state governments, Australians no doubt will expect prime ministers to come and see for themselves, to demonstrate empathy and to instill confidence in recovery. Statistics on natural disasters have been sourced from the Australian Emergency Management Knowledge Hub, Australian Emergency Management Institute, Attorney-General’s Department.